Here is my tested recipe and video tutorial teaching you how to make star bread. 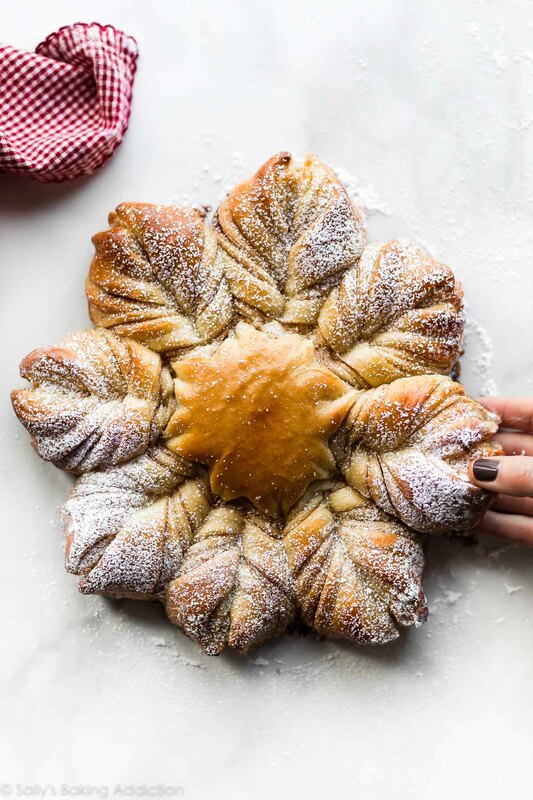 This beautiful holiday brunch recipe is surprisingly easy and impresses everyone! One of the best parts of my summer was visiting Kansas with several other baking bloggers. It was the best experience! We toured wheat farms with Kansas Wheat and baked with Red Star Yeast, one of my beloved partners. There I learned how to make star bread from master bread baker Zoe Bakes; it is one of the most stunning bread creations. Truly a piece of art. Carb art. I’ve always admired this beautiful bread, but was intimidated to try it. It’s so intricate and looks impossible, right? Had I never watched the process, I would’ve NEVER known how EASY it is!! And today I’m showing you how to recreate this masterpiece in a few simple steps. Basically… if you know how to use a knife or pizza cutter, you know how to make star bread. Roll out the star bread. Divide the dough into 4 equal pieces. Roll each out into a rough 10-inch circle. Stack them on top of each other with your filling between each. 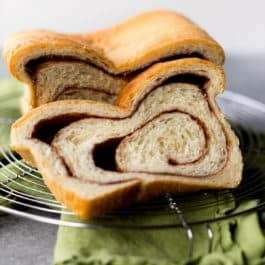 There will be 4 layers of dough and 4 layers of filling. Shape the star bread. As you saw in the video, this isn’t tricky! Cut any scraps around the edges so you have an even circle. Place a 3 inch round object or bowl in the center to make an indent. This is the center of the star. Using a pizza cutter, cut 16 even strips. Grab two strips and twist them away from each other, then press the two ends together. Your star bread will have 8 points. Let it rest for 20 minutes, then bake. Cover the shaped bread and let it rest for 20 minutes before brushing with egg wash and baking. Egg wash promises a beautifully shiny and golden star bread! We’re cutting down the rise time, which makes this star bread process even quicker. 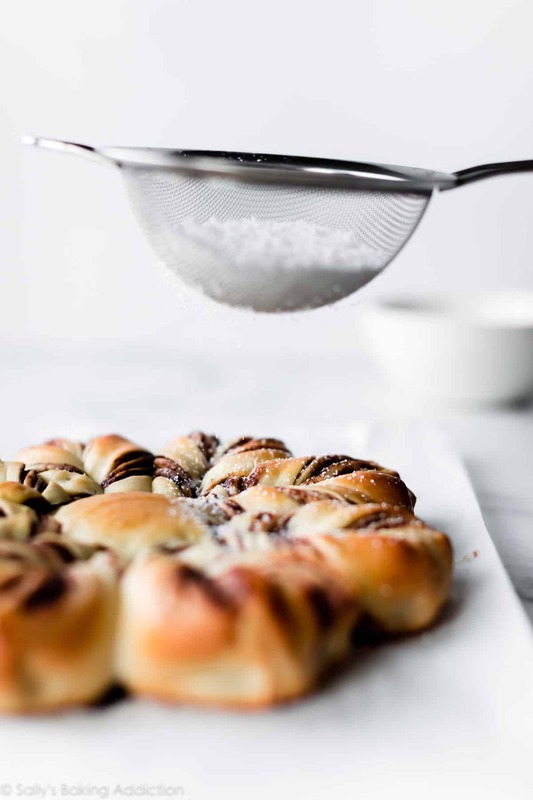 Shaped breads like pull apart bread or cinnamon rolls, typically require 2 rises. A 1st rise for the dough, then a 2nd rise after the dough is shaped. I found this to be problematic with star bread. The 2nd rise gave the dough too much time to puff up, causing the bread to lose its lovely shape when baked. Instead, just cover the shaped star bread and let it rest for about 20 minutes before baking. That’s it! Just 20 minutes, the perfect amount of time to clean up and preheat the oven. This significantly cuts down on our prep time. Yay! Promises the bread holds its shape! 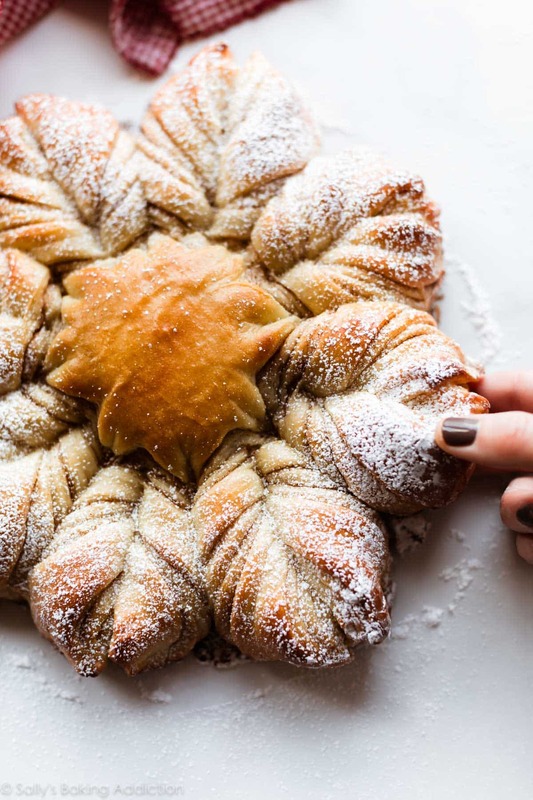 Pictured today is a Nutella star bread and cinnamon sugar star bread. There’s many options when it comes to fillings, but the most important thing to remember is to top each layer lightly. If you go too heavy on the filling, it will spill out everywhere. *Make sure any chunks are very finely chopped. 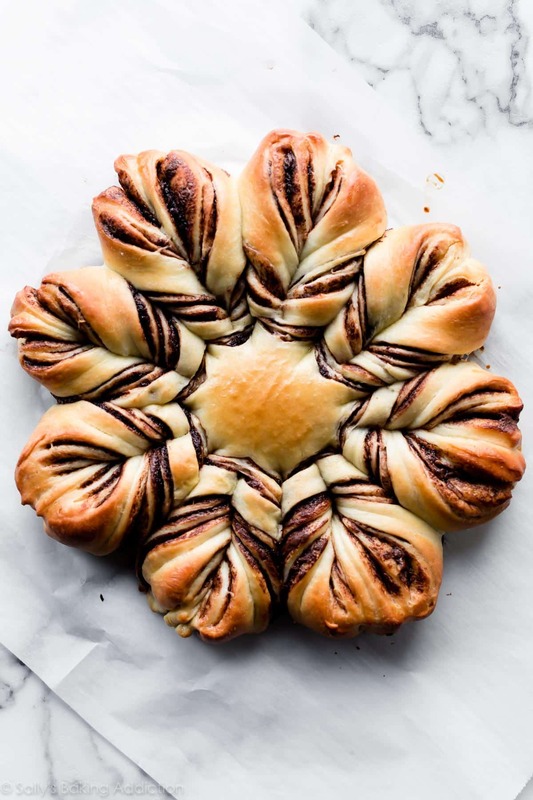 Isn’t the Nutella star bread pretty? 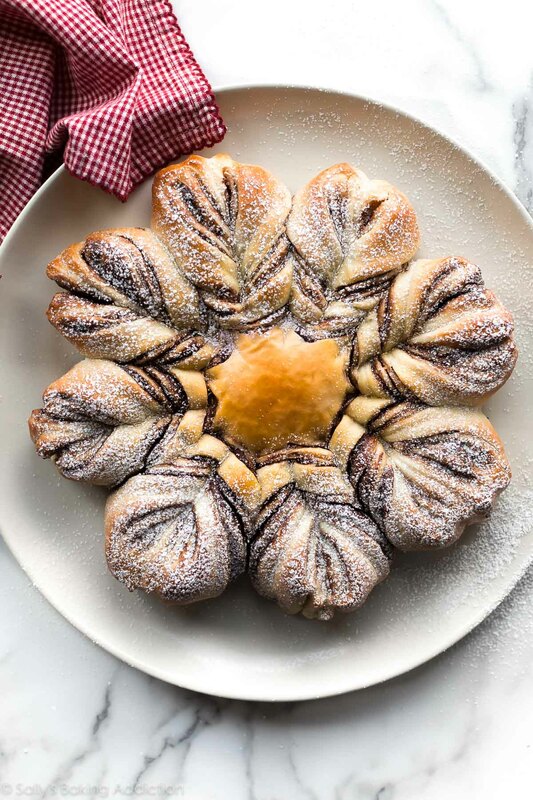 Reminds me of Nutella babka, but easier to shape. Obviously the Nutella variation was very good, but the cinnamon sugar star bread was pure comfort food. 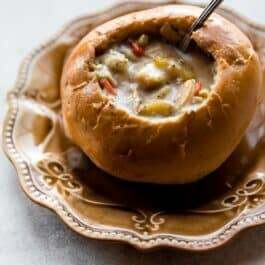 Paired with a buttery soft dough, you can’t go wrong with any filling. 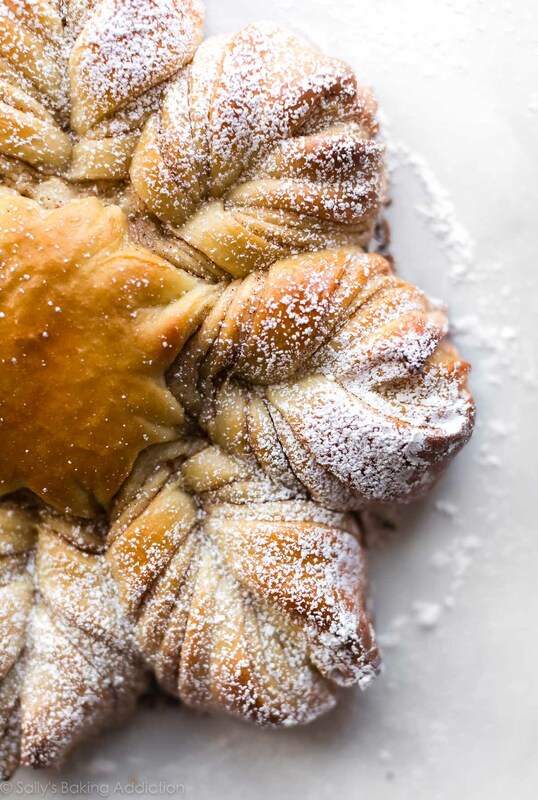 Be the *star* of your holiday get togethers with this easy star bread recipe! Refrigerate dough for up to 1-2 days. Prepare bread dough through step 3 below. After it has risen, punch the dough down to release the air bubbles. Cover the dough tightly, then place it in the refrigerator for up to 2 days. When ready, remove the dough from the refrigerator and let it sit on the counter, uncovered, for 20 minutes. Punch the dough down again to release any air bubbles. Then, continue with step 5 below. Freeze dough for up to 3 months. Prepare bread dough through step 3 below. After it has risen, punch the dough down to release the air bubbles. Cover the dough tightly, then place it in the freezer for up to 3 months. When ready, thaw the bread overnight in the refrigerator. Remove the dough from the refrigerator and let it sit on the counter, uncovered, for 20 minutes. Punch the dough down again to release any air bubbles. Then, continue with step 5 below. 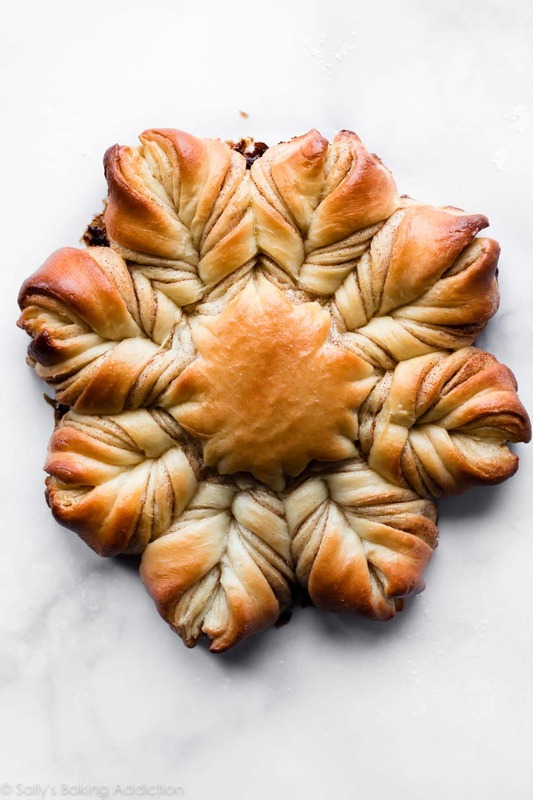 Watch the video tutorial (above) before beginning so you can easily shape this star bread masterpiece. What I love most about this homemade bread recipe, besides its ability to impress EVERYONE, is that the rise times have been reduced. If the bread rises for too long, it could lose its shape. I love a shortcut recipe! Make the dough: Place the yeast and sugar in the bowl of a stand mixer fitted with a dough hook or paddle attachment. Or, if you do not own a stand mixer, a regular large mixing bowl. Heat the milk on the stove or in the microwave until warm to touch, about 110°F (43°C). Pour warm milk on top of yeast/sugar. Whisk gently to combine, then loosely cover with a clean kitchen towel and allow to sit for 5-10 minutes. The mixture will be frothy after 5-10 minutes. If you do not have a mixer, you can mix by hand in this step. Add the butter, egg, flour, and salt. Beat on low speed for 3 minutes. Dough will be soft. Using lightly floured hands, form it into a ball. If the dough is too sticky to handle, add 1-3 more Tablespoons of flour, but you want a very soft dough. Place the dough in a greased bowl (nonstick spray is fine) and cover with plastic wrap or aluminum foil. Place in a slightly warm environment to rise until doubled in size, around 60-90 minutes. For this warm spot, I suggest using the oven. Preheat to 150°F, then turn the oven off after preheating. Place the covered bowl inside and shut the oven door. This is your warm environment. Prepare filling: Line a large baking sheet with parchment paper or a silicone baking mat and prepare your star bread filling. See all my options in the recipe notes below. Assemble the bread: Watch the video above to guide you through this step. Punch down the dough to release the air. Place dough on a lightly floured work surface. Divide into 4 equal pieces and, with a floured rolling pin, roll each out into a thin 10-inch circle. Place the bottom circle on prepared baking sheet. If it lost its circle shape, use your hands to form the edges back into a round shape. Top with filling, then layer the remaining circles and filling on top. The top layer does not have filling on it, so only 3 of the 4 circles will be topped with filling. Using a sharp knife or pizza cutter, cut any scraps around the edges so you have an even circle. Place a 3 inch round object or bowl in the center and make an indent. This is the center of the star. Now it’s time to cut strips from the edge to the center 3-inch circle. Using a pizza cutter, cut 16 even strips. Using both hands, grab two strips and twist them away from each other twice, then press the two ends together to make a point. Your star bread will have 8 points. Cover the shaped bread with plastic wrap or aluminum foil and let it rest for 20 minutes. 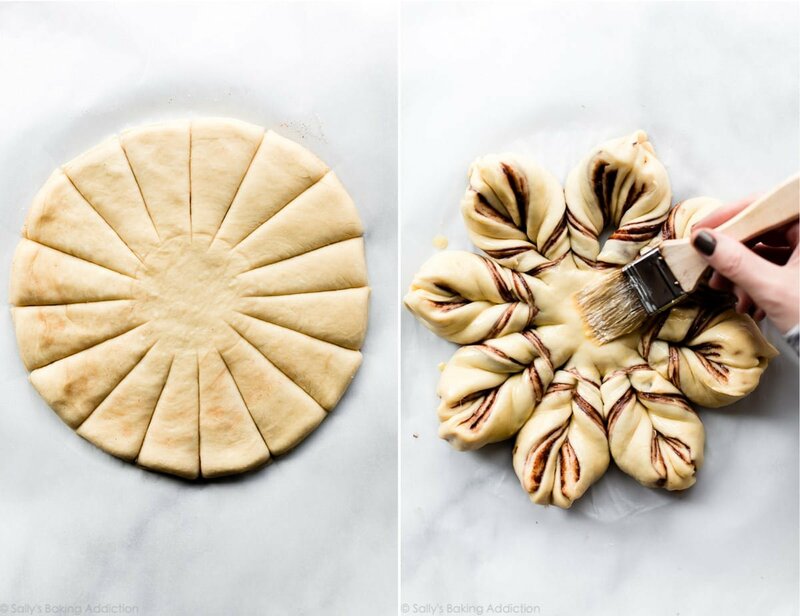 Bake the bread: Using a pastry brush, lightly brush the star bread with egg wash. This ensures a beautifully shiny golden brown bread. Bake for about 25- 30 minutes or until golden brown on top. If you notice the top or points browning too quickly, loosely tent the star bread with aluminum foil. Remove from the oven and cool for 5 minutes. Dust confectioners’ sugar on top and enjoy warm. Cover and store leftover star bread at room temperature for 1-2 days or in the refrigerator for 4-5 days. 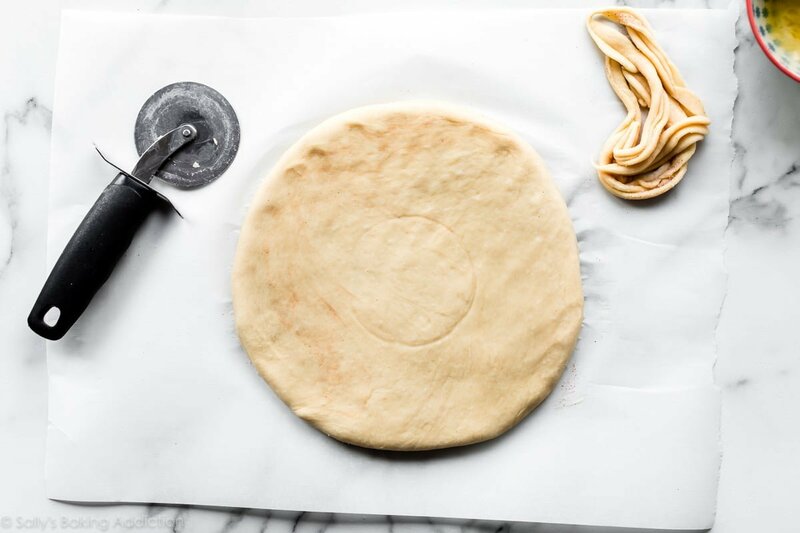 Make Ahead Instructions: Refrigerate dough for up to 1-2 days or freeze up to 3 months. Prepare bread dough through step 3 below. After it has risen, punch the dough down to release the air bubbles. Cover the dough tightly, then place it in the refrigerator for up to 2 days or in the freezer for up to 3 months. When ready, thaw the bread overnight in the refrigerator. (If frozen.) Remove the dough from the refrigerator and let it sit on the counter, uncovered, for 20 minutes. Punch the dough down again to release any air bubbles. Then, continue with step 5. I do not recommend shaping the star bread and refrigerating overnight. Letting the shaped bread sit in the refrigerator overnight risks over-rising and losing its shape. Yeast: I always use Red Star Platinum yeast, an instant yeast. If using active dry yeast, the rise times could be slightly longer. Layers: The top layer does not have filling on it, so only top 3 of the 4 shaped circles. Cinnamon Sugar: Spread 1 Tablespoon of very soft unsalted butter onto each of the 3 circles. Mix 1/4 cup (50g) granulated sugar with 1/2 teaspoon ground cinnamon. Sprinkle evenly over butter on each circle. Nutella: Spread 1 heaping Tablespoon of Nutella onto each of the 3 circles. 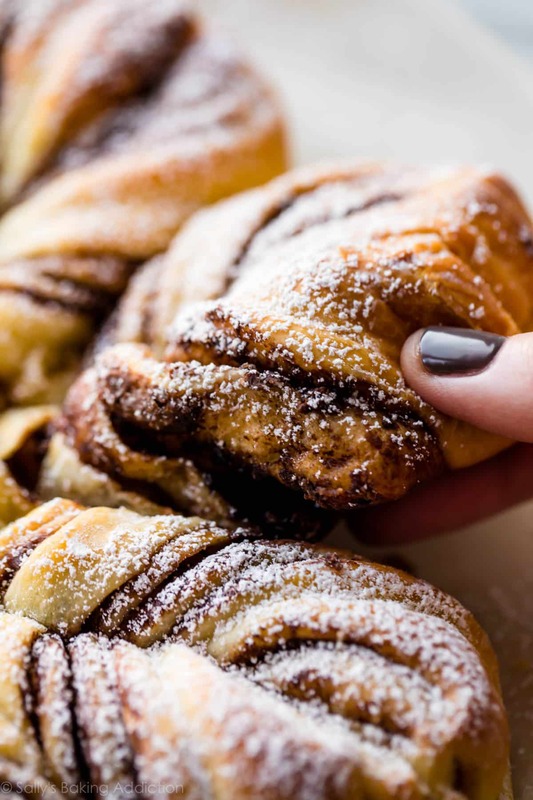 Nutella is difficult to spread onto soft dough, so warm it up in the microwave for a few seconds until it’s a spreadable consistency. Your favorite jam: Spread 1 Tablespoon of jam onto each of the 3 circles. Butter, Brown Sugar, + Ginger: Spread 1 Tablespoon of very soft unsalted butter onto each of the 3 circles. Mix 3 Tablespoons packed light or dark brown sugar with 1/2 teaspoon ground cinnamon and 1 Tablespoon finely chopped crystallized ginger. Sprinkle evenly over butter on each circle. Apple Butter or Pumpkin Butter: Spread 1 heaping Tablespoon onto each of the 3 circles. Chai Spice: Spread 1 Tablespoon of very soft unsalted butter onto each of the 3 circles. Mix 3 Tablespoons granulated sugar with 1/4 teaspoon each ground cinnamon, ground ginger, ground cardamom, and ground allspice. Sprinkle evenly over butter on each circle. Butter + Cinnamon Sugar + Walnuts + Dates: Spread 1 Tablespoon of very soft unsalted butter onto each of the 3 circles. Mix 3 Tablespoons packed brown or granulated sugar with 1/4 teaspoon ground cinnamon, and 2 Tablespoons each finely chopped walnuts and pitted dates. Sprinkle evenly over butter on each circle. 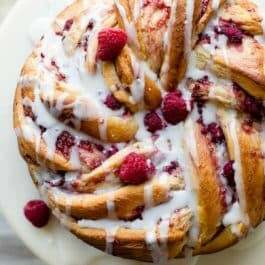 Cinnamon sugar + Orange Zest + Fresh or Dried Cranberries: Spread 1 Tablespoon of very soft unsalted butter onto each of the 3 circles. Mix 3 Tablespoons packed brown or granulated sugar with 1/4 teaspoon ground cinnamon, 2 teaspoons orange zest, and 3 Tablespoons finely chopped fresh or dried cranberries. Sprinkle evenly over butter on each circle. Savory: Reduce sugar in the dough to 1 Tablespoon. Spread 1 heaping Tablespoon of tomato sauce or pesto onto each of the 3 circles. (Try my kale pesto!). Top each with a light layer of shredded cheese, herbs, and/or chopped pepperoni. Method taught by master baker Zoe Bakes!